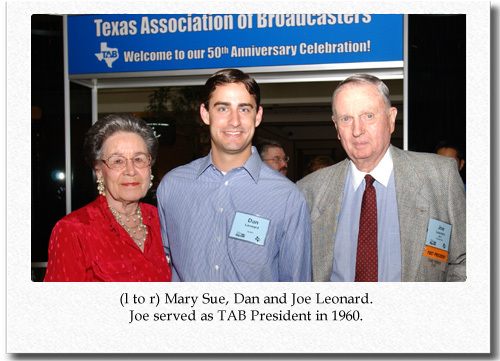 Broadcasters mourn loss of Joe Leonard, Jr.
Texas Pioneer Broadcaster Joe Leonard, Jr., 1960 TAB Chairman, passed away on February 15, 2015. He was 95. Leonard was born and raised in Gainsville, Texas, where he co-founded Gainesville Broadcasting Co., Inc. and the area's first radio station, KGAF-AM/FM in 1947. "Joe was passionate about journalism and music and believed strongly in the power of broadcasting to shape the future of local communities," said TAB President Oscar Rodriguez. "When he was named Pioneer Broadcaster of the Year in 2004 at the age of 85, his energy and enthusiasm seemed as bright as any that has burned in eyes of colleagues decades his junior. "Then and in the years since, he continued to inspire others to work hard and do good – both values he embodied throughout his life." Leonard was also inducted into the Rockabilly Hall of Fame and the Texas Radio Hall of Fame. A memorial service will be held on Friday, February 20, 2015 at 11:00 am for Joe M. Leonard, Jr. at St. Paul's Episcopal Church. No visitation is planned. Arrangements are under the Geo. J. Carroll and Son Funeral Home. The family suggests donations be made to St. Paul's Episcopal Church, PO Box 635, Gainesville, TX 76241 or Boys and Girls Club of Cooke County, 315 W. Hird St., Gainesville, TX 76240.